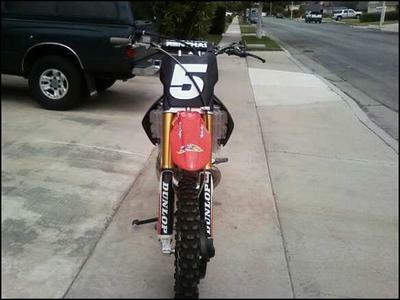 The titled 2006 Honda CR250R dirt bike for sale had the cylinder plated and a Wiseco Piston kit installed in April 2011. The bike has very low hours and has new tires on both front and rear. 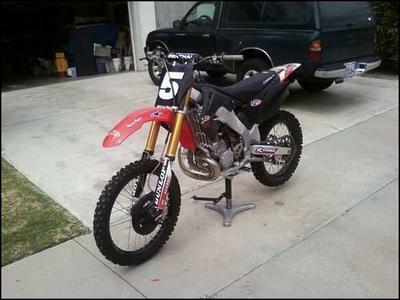 This an extremely fast bike but it's never been used as a racing bike and it's in Perfect mechanical condition! 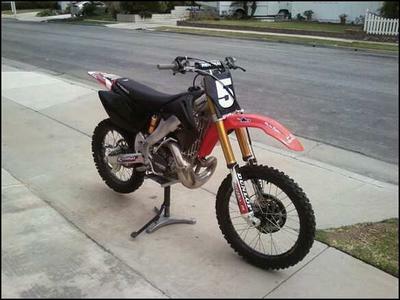 and if you would like to write a review or voice any opinions on the used dirt bike for sale, you may use the comments form below this ad to do so. Thanks for visiting GoGoCycles Used Motorcycles for Sale and for taking a look at my 2006 Honda CR250R . My location is Mercersburg in the Cumberland Valley region and in my opinion my asking price is cheap enough that it can't be beat on Craigslist or in an Ebay auction; only $2650 or you are welcome to submit a best offer bid when you call me. If you want to take a look or have questions, E-mail for more details and don't forget to mention that you found this ad on GoGoCycles Used Motorcycles for Sale www.gogocycles.com. How much and is it legal. i was with Honda factory just the transmission alone is bullet proof in its weight and gold" then the bikes all come Dyno tested to the rear tires for horse power to weight ratio tested for pounds to ground in dirt.